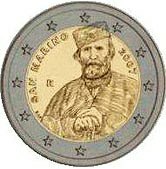 Details relating to the San Marino Commemorative of 2007. This coin commemorates the 200th birthday of Giuseppe Garibaldi. Garibaldi was one of the three leading figures in the unification/creation of the modern Italian state. The other two were Cavour(the statesman) and Mazzini (the philosopher). Garibaldi represents the military side of the unification. Owing to his military genius he gained several important victories in the struggle for Italian independence, including a victory against the Austrians. He soon became a national hero. He died sadly in exile. The motif of the coin is simply a portrait of Garibaldi that fills most of the inner circle. The depiction in the coin is a remarkably good portrayal of Garibaldi. Around the edge of the inner circle, the name of the issuing country SAN MARINO appears from eight to eleven o'clock and the year of issue at two o'clock. The mint mark (R ) is seen at nine o’clock and the initials(e.l.f. )of the designer, rather small and hard to spot, can be seen at eight o’clock. Return from San Marino Commemorative 2007 to euro coin collector.